An email offering dating services has been caught by spam filters and should be treated as malicious. It is said to be sent from Anastasia Date; an international online dating service that predominantly connects men to women from eastern Europe. Russian women seem to be pushed a lot in these types of scams. Delete this email if received because at the very least, it scores so highly on multiple spammers lists and at most, may result in a malware infection. This email is clearly unwanted by the recipient. Figure A shows the email in question. The first impressions of this one is overwhelming, there is a lot of content, imagery and hyperlinks which automatically rings spam bells. The subject line is “(1) New Message” which is generic enough to intrigue, interest for the receiver to open and explore further. 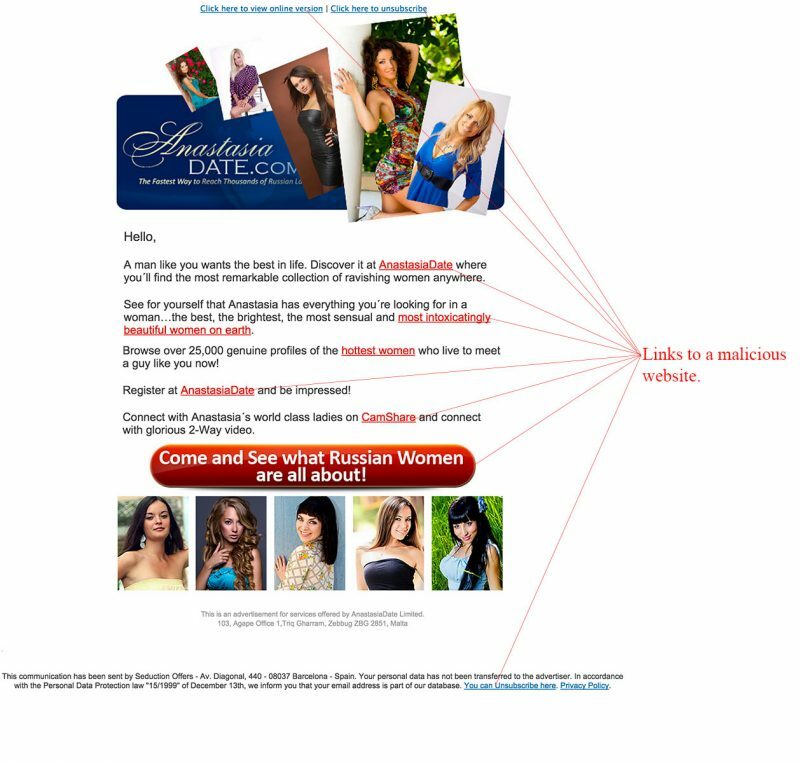 The sender is shown as “Anastasia – Seduction Offers” however the email address is not associated with the official Anastasia Date website and is clearly spam. There are quite a few pushy and malicious links within this email – don’t click anywhere within this email. Figure B is the website you will land on if any of the malicious links within the email is clicked. It is quite well branded for the industry and asks for further information to ‘sign up’ to the dating service. There is also relevant content and testimonial videos which are an attempt to convince you of its authenticity. Avoid clicking anywhere on this page. We strongly suggest moving forward with caution when receiving any email in your inbox that you are not familiar with or did not sign up for. 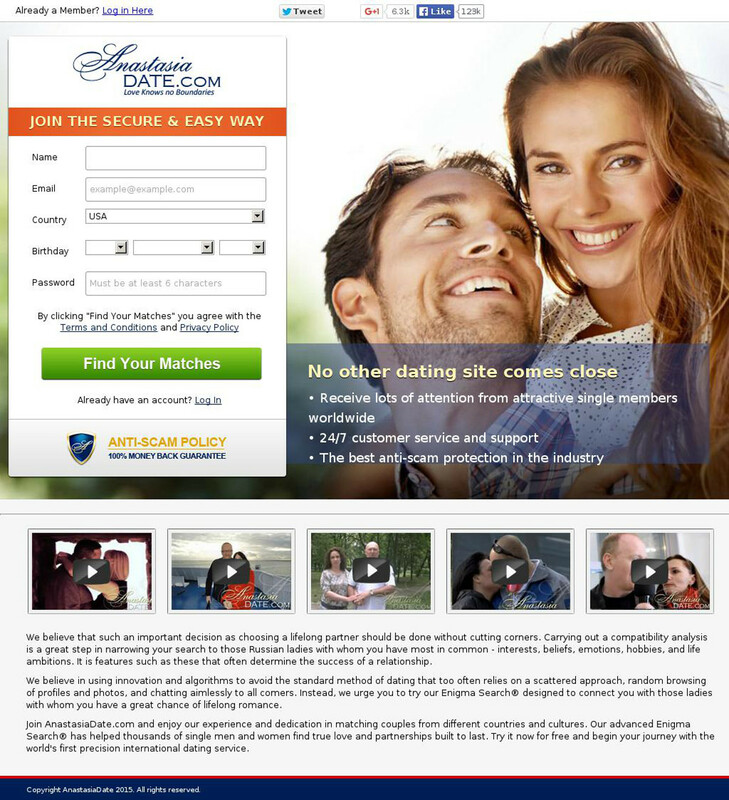 If you are looking for a legitimate dating website, use the ones you know and trust. Where in the world did the bulk of this Email come from? Yes but how do I stop the emails from getting to my inbox in the first place? Hi Paul. Thank you for raising that, as this particular one is just spam, the dating site sends to email lists they either have or purchase. How you block it depends primarily on how you receive your email. If you use a Cloud based Email filter like MailShark, you do it from the “Lists” function which allows you to control your “Approved/Banned” lists via the web. In this way it quarantines the email on the cloud and you don’t even get it. If you don’t have a cloud based email filter and instead receive email directly to a mailbox somewhere, then you can usually setup Inbound Email rules on your client which can look for keywords in subject lines or sender addresses and filter that email into a “Junk” folder or simply to your “Deleted Items” or “Trash” folder so you never even have to see it.